Chronicle Herald cartoonist Bruce MacKinnon is somewhat used to striking a chord with his pointed pen. Sometimes people love his drawings and sometimes not. Sometimes, they just appreciate his political point of view. This week, Americans have been sharing the heck out of his drawing from Oct. 4, 2017, sparked by a shooting in Las Vegas. After a teen at Marjory Stoneman Douglas High School in Parkland, Fla., shot and killed 17 students and teachers on Wednesday, MacKinnon’s take on the Vegas shooting came back to life. 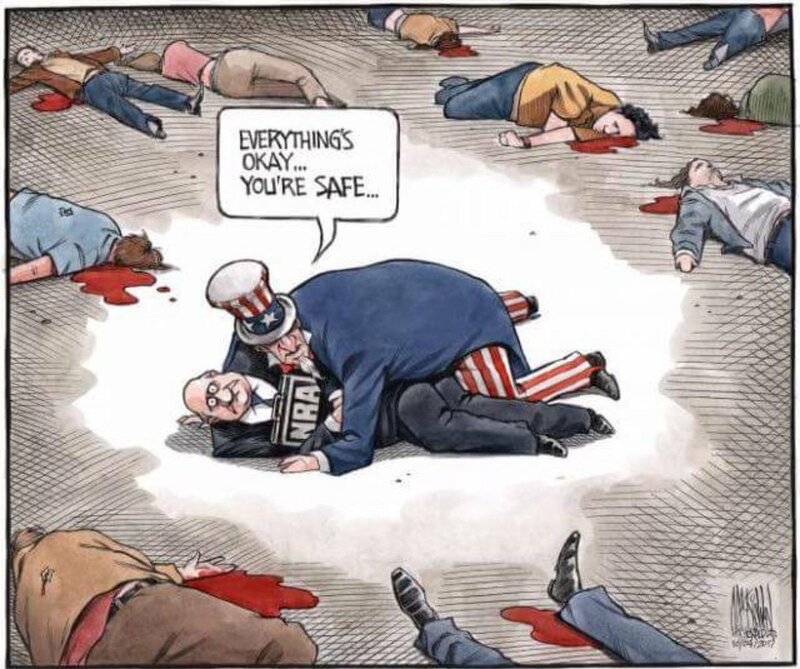 The Parkland shooting was on Wednesday afternoon. MacKinnon’s Las Vegas toon was posted to a Facebook page called We Resist about three hours later, and by Friday afternoon that post had been shared 640,000 times, and attracted 18,000 comments and 88,000 reactions. 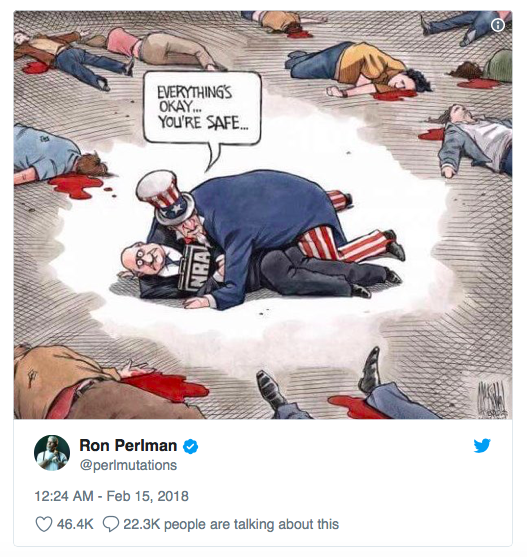 About twelve hours after the Facebook post, actor Ron Perlman tweeted the cartoon to his 660,000 followers, attracting 21,000 retweets and 44,000 likes. Other famous actors and musicians retweeted Perlman’s tweet, including Mark Hamill (Luke Skywalker in Star Wars) and Steven Van Zandt (guitarist for Bruce Springsteen’s E Street Band and an actor who played Silvio Dante on The Sopranos).